The holidays are almost here. Along with all the joy of the season often comes the stress of bills and wanting more money to buy gifts for all your family and friends. With a new work from home opportunity, you can vanquish those worries and enjoy the holidays stress free. Now is the time to start thinking about the business opportunity that the Arise Platform has to offer. If you sign up now, you can be in charge for the new year! Be your own boss. You make the rules! Flexible hours. You decide when you work and when you don’t. Take time for what you want to do with your newly gained free time. No commute necessary. Save on gas and no rush hour. There are many different projects to service on the Arise Platform, find clients in the industries that interest you most. You get to select the client program that match your skills and your earnings expectations. Grow your company. If you know anyone else who would like to work from home, they can work for your company. You control your earning potential based on how large you grow your business. The more you and your agents work, the more revenue your company will generate. And if you just want to be a solo-preneur, the more you work, the more you earn. Your hard work, drive, and dedication are rewarded. You can start your own home-based call center using the Arise Platform to provide inbound customer service support to Fortune 500 clients. Choose the type of business that fits your personality and skills best. 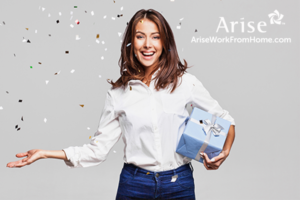 The Arise Platform provides a unique opportunity for entrepreneurial-minded, self-motivated individuals to start their own virtual call center. Be your own boss and make your own hours without a huge investment in equipment; and work from the comfort of your own home. When you are in control of your earnings potential, this will allow you to enjoy the fruits of earning extra income. Are you ready to start earning extra money from the comfort of your own home? Give yourself the gift of a work from home business this year! Click here to get started!